The Garden Hills Civic Association (GHCA) is a voluntary and non-profit neighborhood organization tracing its origin back to 1934. It is comprised of hundreds of members and focuses on protecting and preserving our neighborhood while helping to foster a sense of community. Community Events We organize the Pancake Breakfast, tree plantings, neighborhood meetings, park clean-ups, and more! Please help us expand this list. 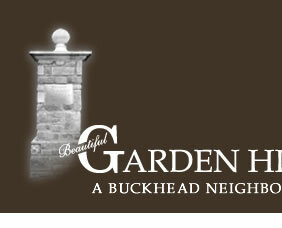 Communications We distribute the Garden Hills Town Crier email alerts to 1,000 recipients, maintain the www.gardenhills.net website, organize public meetings and publish the neighborhood directory. Zoning We maintain protective covenants on several properties in the neighborhood and take an active role to minimize impact to the character of the neighborhood by making recommendations to NPU-B for variance requests, renovations, and major applications. Security Patrol Your dues fund the security patrol that is staffed with off duty Atlanta Police Officers. Last year, our Patrol logged more than 1,796 patrol hours in Garden Hills, performed over 219 home security checks for members while they were out of town, assisted in having several abandoned vehicles removed and performed several home security surveys. Visioning We collect your ideas and use them as input to a collaborative process resulting in approved concepts and standards to implement throughout Garden Hills. Interested in seeing more about what the civic association does? Civic Association membership dues are $200 annually. Visit the Membership Page for details.